Preheat oven to 350 degrees Fahrenheit. In a large skillet over medium heat, melt margarine. Add and cook “sausage”, onions, celery, and apples until tender, about 5 minutes. Place bread cubes in a large bowl. Pour skillet mixture over breadcrumbs and toss until well combined. Combine seasonings in a small cup and stir. Sprinkle seasoning over stuffing and stir well to combine. 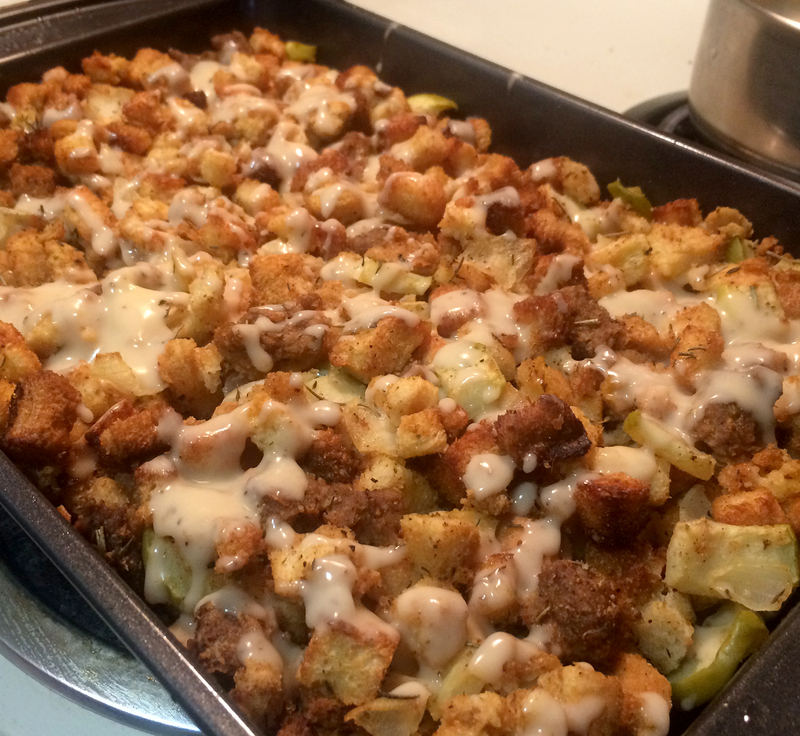 Grease a 13×9 baking dish, spread stuffing mixture evenly in dish*. For a softer stuffing cover with aluminum foil. For a crispy brown crust dot the top with margarine and bake uncovered. Bake 30-40 minutes. Serve plain or with a side of pepper gravy. Makes 10-12 servings. *Note – Stuffing baked in a dish can be assembled ahead of time and go directly from the fridge to the oven. I’m not a vegan so I wouldn’t mind, but I do have to point out the recipe includes eggs, which is an animal product. I would change your title to vegetarian to not upset someone who may not notice until they are about to make the dish.